Interesting fact: Here on August 9, 1942 in the midst of the blockade, the 7th “Leningrad” Symphony of Shostakovich was performed. The creation of the Symphony took place during the period of the blockade of the city. 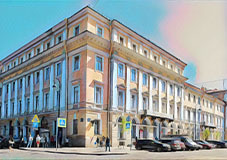 The composer himself was evacuated to Kuibyshev. The score was brought to the city by plane. There were only 15 musicians in the Petersburg Philharmonic Orchestra, the rest were either dead or so weak from hunger that they could not play at all. The musicians to the orchestra were sent from the front. During the performance, the symphony was broadcasted through all the loudspeakers of almost dead but not surrendering Leningrad. «Then, August 9, 1942, we realized that we would lose this war. We felt your strength, capable to overcome the hunger, fear and even death …» (Wehrmacht veterans in the conversation with Eliasberg, who conducted the orchestra that day).